Saturday, November 1st, 2019, 5:00 pm – 10:00 pm. The horse barn is completely transformed for this magical evening. 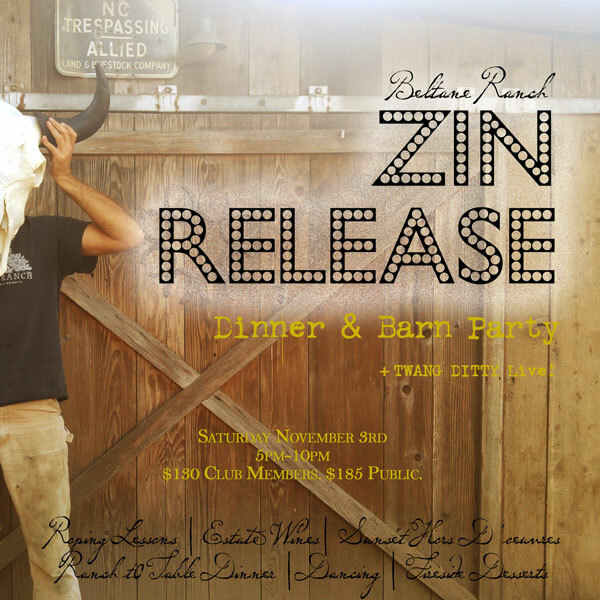 Join Winemaker Kevin Holt and the entire Beltane Ranch Family for an extraordinary evening: Sunset Hors d’oeuvres & roping lessons with local cowboy Tony Knecht, followed by a multi course estate-grown dinner by Chef Greg Markey, expertly paired with our estate wines. Next, get up and dance to Live Western Swing by Twang Ditty (Back by Popular Demand!) and enjoy fireside s’mores.